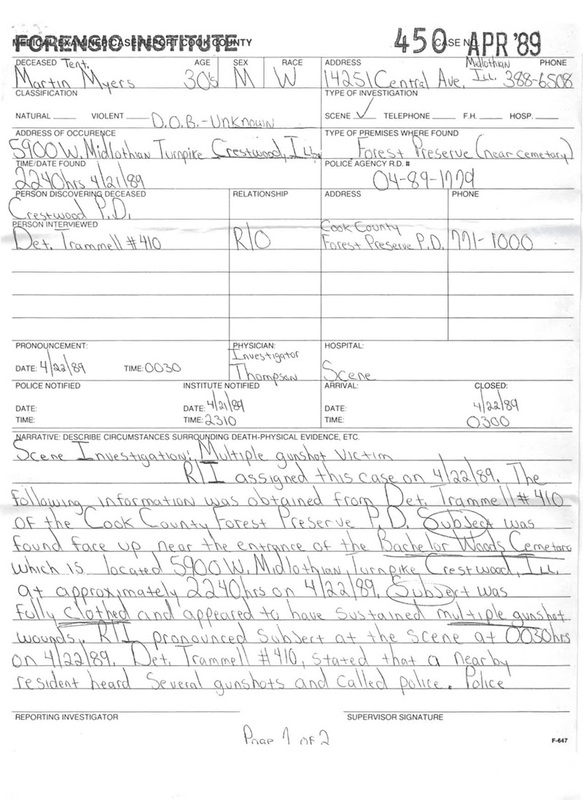 Police report courtesy of Pete Crapia of Illinois. Police investigating the gunshot murder of a Midlothian man whose body was found in a secluded forest preserve cemetery said Wednesday that they have located witnesses and are close to solving the slaying. The victim, Martin Myers, 43, of 14251 S. Central Ave., had been scheduled to go on trial Tuesday in Markham, charged with first-degree murder in the death of a man he ran over with his utility truck. 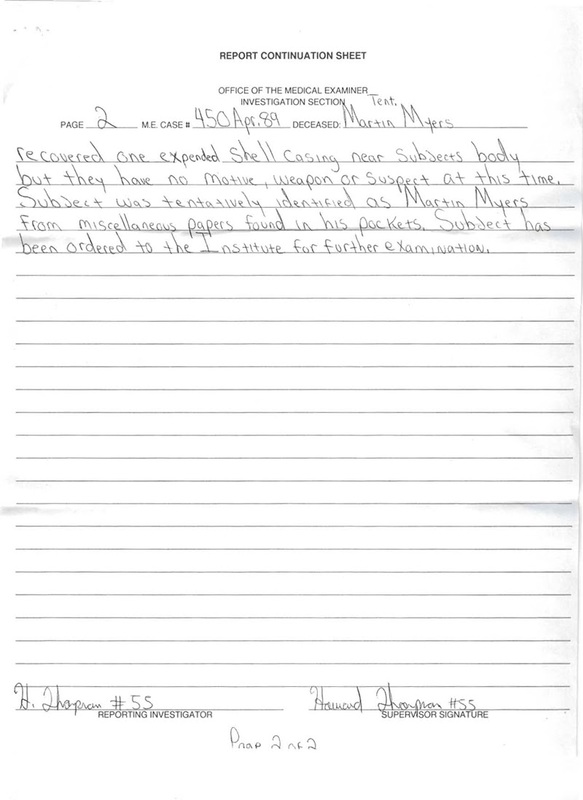 Before his death, Myers had entered a not guilty plea to the charge. Palacios would not disclose the motive for the killing. But he said that the extensive investigation had taken his investigators to Boston and that queries had been made to police departments in other states. Robbery had been ruled out as a motive earlier, though Myers' wallet contained no money or credit cards. ''We're working now to put together a few loose ends on the case,'' Palacios said. Myers had been shot once in the head and once in the abdomen. His body was found at about 10:30 p.m. on April 21 near the entrance to the abandoned Bachelor Woods cemetery in the Rubio Woods Forest Preserve. The cemetery is about a mile east of Harlem Avenue on 147th Street near Oak Forest. Ghost hunters have called the cemetery and its surrounding marsh area one of the scariest in the Chicago area. Palacios said the location is often visited on Halloween and other nights by ghost hunters because of reported sightings of a pale blue light that moves and flies through the wooded marsh. Hickory Hills detective Michael Tardi said that Myers, an unemployed truck driver, had been charged with murder in the Jan. 7 death of Mark Lee Tilton, 31. Tilton had relatives in the south suburbs but had been living and working in Houston. He recently returned to the area and had been living out of his truck, police said. Tilton's death at first appeared to be a hit-and-run accident, but an investigation led to Myers and the murder charge against him. Tardi said that Tilton was walking along Kean Avenue at about the 8300 block south on the evening of Jan. 7 when Myers spotted him. Myers first drove past Tilton but then turned his truck around, increased his speed and struck Tilton head-on, police said. Tilton died of multiple injuries. Both men were on their way to a nearby saloon at the time, Tardi said. In charging Myers with murder, police had alleged that the two men were rivals for the affections of a woman. Tardi said the two had fought publicly over the woman. Myers was twice divorced and had two children.